The Olympic park development has both fans and critics. Whichever side you’re on, it’s at the very least a visually interesting part of the city to wander around. Hackney Wick once had the feel of an industrial wasteland but has become a prime hipster hangout, with a number of craft beer bars, an independent theatre and some pop-up eateries. There’s also a network of canals running through the area with views over the old Olympic site and some of the rest of the city. I like sitting on the canal side with a beer soaking up the atmosphere and popping into one of the many bars when it gets too chilly. 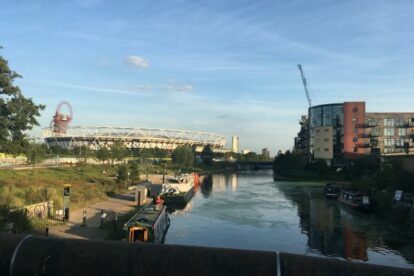 From the canals you can also wander over to the Olympic park itself where you can participate in sports – form BMX to taekwondo – or slide down the Orbit sculpture slide. Check the Queen Elizabeth Olympic Park website for what’s on and bookings.